Welcome! My name is Esther Loopstra. I've been trying to figure out what I can do to stay informed, fight for justice and use my passion and skills to encourage others to do the same. This page contains some resources that will help you get organized and keep up the fight to save our civil liberties and make positive change. 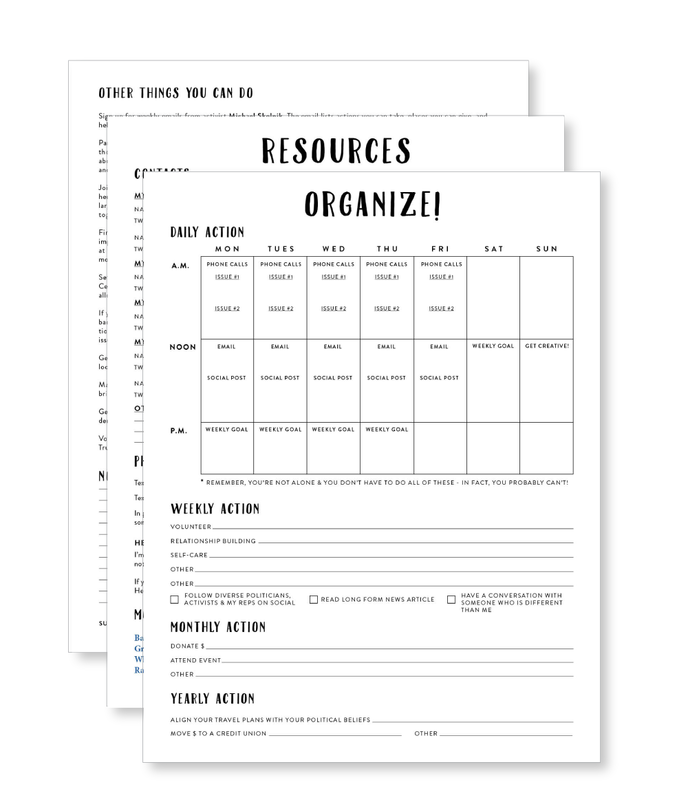 I teamed up with an awesome writer and activist Erica Sklar to create this free template and resource list. We know how overwhelming resistance can be, by staying organized, we hope that you'll be able to concentrate on taking action. Download the pdf and you can type in the blanks directly or print it out weekly and write in your actions. There's a handy spot to write down the names of your representatives, options for weekly, monthly, and annual actions, and links to some of our favorite resources. You probably won't accomplish every single action we've listed, but we wanted to give you plenty of options. It's up to you to schedule what's reasonable and stick to it. There are tons of options for where to keep your schedule—print it for your bullet journal, stick it to your fridge, or leave it open as a tab in your browser. No matter where you keep it, we hope it reminds you that staying organized and taking action will get us all through the next four years and probably the rest of our lives. Please drop us a line if we can help, or if you have questions, additions, or revisions! We're here for you. Now, more than ever we need to take a stand against discrimination and the rhetoric of hate that has been abundant in this country. Let's work together to uphold our civil liberties and protect each other in the face of an unknown future. Wearing this button let's others know that you stand with them as an ally and support them in their fight for equality. This is a largish button with a lovely matte finish, lettering designed by me! Thank you! I'll let you know when I get the T-shirts up on my site! SIGN UP FOR MY WEEKLY CREATIVE NEWSLETTER!